Earlier in the week we highlighted a pair of options calls in the Morgan Stanley chain following the company’s Q3 earnings report on Tuesday, in which it reported a solid beat of Wall Street expectations on profits. As a result, the MS Weekly $43.50 & $44 Calls that we signaled in our report produced some very nice chances for traders to lock in multi-bag profits. Paypal, Inc. PYPL - The first of our earnings related options ideas to close out the week is going to be Paypal, whose stock saw early gains on the heels of the company’s report which entailed a big boost from the company’s Venmo offshoot. Revenue streams have been growing as Paypal has launched several initiatives within the platform. We are going to be looking at the PYPL Weekly $81-83 Calls* as we close out the trading week. *Please do not attempt to trade options with a weekly expiration on a Friday unless you are an advanced level trader with disposable funds. It’s an extreme risk/reward proposition! Our first order of business today is going to be to take a look at the incredible year AMD has had. We’ve mentioned it quite a few times along the way, but if we track all the way back to April 26th, we see that we caught this stock at a low of 10.61. AMD has been an absolute juggernaught all year, and this morning in the premarket trades are going off at 33.25. That’s 213% higher than our observed share price this spring, and AMD shows little sign of slowing its gradual ascent. In terms of options ideas, we are going to put an observation tag on the AMD Weekly $32-33 Calls. Yesterday morning for a fresh options idea,we stated that if we saw ADBE maintain support at or above 258.49, we were going to be very interested in the ADBE 10/26 $260-265 Calls. We would not be at all surprised to have to swing back around to report much larger gains down the road on these ideas, but yesterday’s activity was a solid start. Blue Horseshoe Stocks: New Highs Everywhere! We were just updating readers on the progress of TLRY, DCTH, and NBEV in yesterday morning’s report. We were already impressed with their performances prior to yesterday, and yet each one managed to pile on the potential gains. All three rose sharply to new highs, so we’re coming right back to recap those excellent moves today. .
New Age Beverage Holdings, Inc. NBEV - Lastly, NBEV also logged its biggest single-day performance of all-time yesterday, as the stock ran to a new high of 4.94. We’ve been mentioning it frequently since the 4th of this month, as it was trading for as little as 1.50. We’ve thus far witnessed a 229% run in NBEV, who will be rolling out a CBD beverage line at an upcoming conference early next month. We do our best to keep up with all of the stocks we mention in our daily premarket reports, and this morning, we want to swing back to HEAR, which we were signaling for observation back on April 9-10th. Shortly thereafter, the stock traded for as little as 2.76, before beginning a steady month-long bull run. Yesterday, HEAR attained a new high of 7.48, marking an excellent move up of 171% inside of the past month! Cheers go out to anyone who might’ve been able to take advantage of this very fine call. 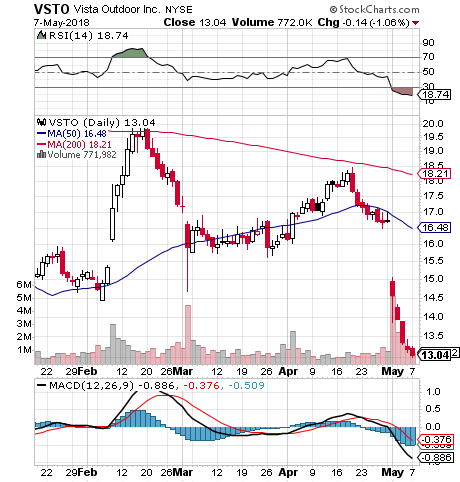 We ran across VTO on our routine morning scan today, and want to include it as a high-potential bottom watch play. Whenever we see a stock this beaten back, and so egregiously oversold, we immediately go into rebound watch mode. To help us take advantage of a possible recovery, which is overdue at this point, we’re going to want to signal an options idea to keep watch over in the days and/or weeks ahead- the VSTO 08/17 $15 Calls. On Friday morning, we selected a pair of contracts in the PSMT options chain, and we want to start off this new trading week by updating our readers on the excellent progress those calls made. Our targets were the PSMT 04/20 $80 & $85 Calls and some very nice intraday gains were posted on both counts. The $80 Calls made their way from a low of 5.12 up to 10.98 for a move of 114% while The $85′s traded up from 2.50 to 6.70, marking a 168% rip. We also want to look back on the recent performance of NIHD. We placed this stock on watch in our report from the morning of February 28th, and after seeing its low the following day, the stock hasn’t looked back since. From that low, which came in at 1.115 (03/01), NIHD has gradually pressed its way up as high as Friday’s mark of 2.6092, which represents a 134% swing in the course of five trading weeks.